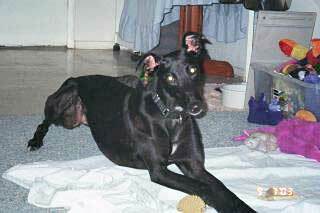 Chloe is a 4-year-old beautiful petite black female, born September 6, 2000. Chloe's sire is Solitary Runner and her dam is House Payment; however, unlike her siblings Allie, Betsy, Jenny and Danielle, she was not registered individually with the NGA. Chloe did not race as her front right leg was broken before her training started. It is completely healed and has a metal plate in it, which does not impair her mobility at all. She loves to run and play at the park. Chloe was adopted over a year ago to a person with disabilities who is now unable to care for her. She was an only dog and did well. Previously she was in a foster home that had a dog door, which she loved. Her previous and current foster homes also have other greyhounds and larger dogs, and she gets along well with everyone. Chloe is small animal and cat trainable - will need diligent work (displays curiosity, but responds to "no kitty"). 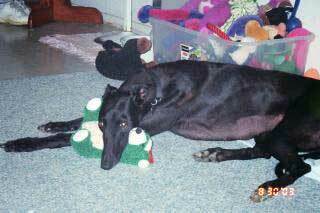 Chloe tested positive for Ehrlichia when she originally came to GALT and completed her medical treatment before she was adopted. 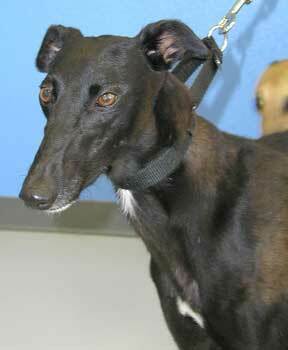 GALT will re-test her again before she is adopted.